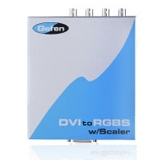 The DVI to RGBS Scaler box takes your DVI-I computer video card/HDTV video signal and converts it to analog RGBS formats. Now you can display desktop or laptop computer and/or HDTV content on your analog RGBS display or projector. Available and selectable video formats include RGB, RGBS at sync 0.3V, RGBS at sync 5V, and YPbPr Component video.